The last decade has shown an increasing number of reports about the usefulness and accuracy of scrotal ultrasound in testicular measurement, ,,, whereas the orchidometer and calipers often overestimate testicular volume; hence, the latter's objectivity in different hands is questionable. Other radiological methods such as computed tomography (CT) and magnetic resonance imaging are more accurate and objective, but for their relative nonavailability, high cost, and the ionizing radiation in CT and make their use in routine testicular assessment more challenging. Ultrasonographically measured testicular volume is considered standard; studies have shown ultrasonographic volumes to be more accurate than those obtained by nonradiological clinical methods. ,, Ultrasound is especially very sensitive to small volume change when compared to the former (nonradiological methods); it is affordable, readily available, and nonionizing. These features make ultrasound easily the best method for radiological testicular volume assessment. A number of diseases, both local and systemic, have effects on the testicular sizes. It is therefore of immense value to have a set of normal measurements so as to compare when such patients are examined. Since the testicular size, especially in the adolescent, provides a rough indication of the testicular function, , it is imperative to know the range of normal testicular dimensions in any population for the diagnosis, treatment, and prognosis of testicular diseases. Although measurement of pediatric testicular volume has been carried out in Europe ,, and some parts of Africa,  no such study is available in Nigeria. A few studies on testicular pathologies in Nigerian boys , are however documented, and most are limited because of the ages and the sample sizes involved. A study carried out by Kiridi et al. recently addressed adult normative values in Nigeria. This study seeks to provide baseline data for pediatric age group in this environment and will also be helpful in the future in the management of testicular abnormalities. Baseline studies of the normal are an essential prelude to the proper understanding of derangement in the anatomy and physiology of any body part. Testicular volume is related to various reproductive endocrine parameters; therefore, its availability is very informative to the clinician. Ultrasound is a valid method to measure small prepubertal testicles as it is able to detect minor changes in volume in relation to established physiological changes in the 1 st year of life. This is particularly necessary since ultrasound is readily available and affordable to most patients in this center; it is safe as it uses nonionizing radiation. Scans can be video recorded, stored, and reproduced when required. The study was a cross-sectional study design involving boys aged 0-15 years. Children were recruited from Ahmadu Bello University Teaching Hospital, Nigeria, representing different socioeconomic settings. Children <1 year were recruited from the delivery suites, immunization, and well-baby clinics. Children between 1 and 15 years were recruited from those presenting to the pediatric outpatient department with acute illnesses after excluding chromosomal and hormonal disorders, chronic illness, and local testicular disease conditions. The estimated sample size was calculated using a prevalence rate of 0.5; hence, a minimum sample size of 384 was arrived at, but 450 boys were recruited. Stratified sampling was used to select subjects for each stratum (age group). The number of subjects in each stratum was determined using probability proportionate to the estimated population size. Boys aged 0-15 years of age whose parent's consented to the study. Known history of endocrine and genetic disorders that may affect the testes, for example, Klinefelter's syndrome, sickle cell disease, hypopituitarism, diabetes mellitus (Type 1), etc. Chronic debilitating diseases, for example, protein energy malnutrition, tuberculosis. Approval of the medical and ethical committee of Ahmadu Bello University, Teaching Hospital, Zaria, was sought before the study. The selected well-baby, postnatal clinics, and delivery suite were contacted and their approvals obtained before the study. Parents' informed consent was also obtained before the inclusion of their children in the study. All information obtained from the subjects and scan results were treated as private and confidential. All measurements were taken thrice. The average of the two closest measurements in each case was taken as the child's weight and height (length). Age-appropriate language was used to explain to the children what the examination entails. Each child was examined individually in private, in the presence of a parent/guardian or chaperon. The testes were then assessed for the presence of any of the exclusion criteria. Consent was sought and procedure explained to the subjects; afterward, they were examined supine on a couch in a warm environment at room temperature, with abdomen exposed up to mid-thigh and legs put together. The scrotum was supported on a warm towel draped beneath it or in a warm gloved hand; older children were asked to hold and pull their phallus slightly toward the abdomen to expose the scrotum with the testicles into profile. The testes were examined with a portable ALOKA SSD-3500 (Osaka-Japan) using a 7.5 MHz linear transducer after applying adequate coupling gel. The lengths (Ls) were measured from the longitudinal scan, i.e., between the upper and lower pole, this was achieved by manipulating the probe until the mediastinum testis is visualized. 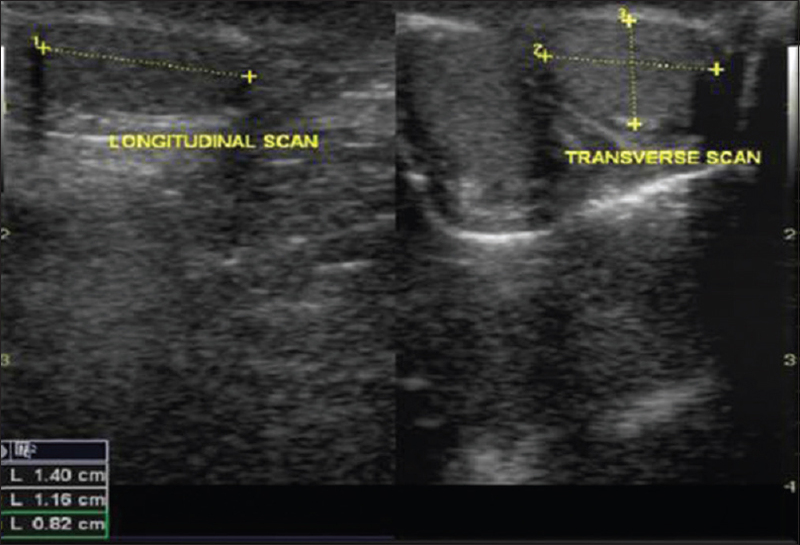 The width (W) and anteroposterior thickness (H) were measured from the transverse scan; i.e. the maximum diameters perpendicular to each other at the level of the rete testis [Figure 1]. Measurements were taken using the electronic calipers of the ultrasound machine. Three measurements were taken and the average of the closest two was obtained. Children selected were each given a study number. Baseline characteristics of each subject as well as all measurements were documented separately in a specially designed pro forma for the study. The transducer gel was wiped off completely from the subject's body to avoid irritation when it dries up. The possibility of transfer of skin infection was minimized by use of antiseptics to wipe the probe between patients. The testicular volume was calculated using the Lamberts formula, i.e., L × W × H × 0.71, where L = length, W = width, H = height or A-P diameter, and 0.71 = correction factor. Data were analyzed using SPSS version 17 statistical software (SPSS inc. Released 2008. SPSS statistics for windows, version 17.0 Chicago). Differences between the testicular variables on either side were tested using Student's t-test while that between age groups were tested using ANOVA, all at P < 0.05. Data were presented in tables and chart as appropriate with mean and standard deviation. A total of 450 boys, whose mean age was 53.63 ± 53.06 months, ranging from 0.20 months to 180 months participated in the study. The median age is 34.5 months. About 65% (293) are aged 5 years and below, and only 17% (77) were over 10 years [Table 1]. The mean weight is 15.5 ± 10.33 kg and range 2.7-56 kg. The median and modal weights are 12.70 kg and 15 kg, respectively. The mean height is 95.65 ± 31.38 cm, range of 47-166 cm, and median height of 90.8 cm. The mean body mass index (BMI) is 15.45 ± 2.4 kg/m 2 and range of 10.26-30.56 kg/m 2 [Table 1] and [Table 2]. The values for volume of both testicles are as follow: mean: 1.28 ± 1.03 ml, median: 0.77 ml, and range: 0.24-6.87 ml. The length for both testicles has a mean value of 1.68 ± 0.67 cm, median of 1.48 cm, and range of 0.40-5.88 cm. The testicular width has mean value of 1.01 ± 0.41 cm, median value of 0.90 cm, and range 0.52 cm to 3.98 cm. The A-P diameter has mean value of 0.80 ± 0.19 cm, median value of 0.76 cm, and range 0.39 cm to 1.81 cm [Table 1] and [Table 2]. The mean right testicular volume is 1.43 ± 1.05 ml and range of 0.24-17.06 ml; the median and mode values were 0.77 ml and 0.76 ml, respectively. The left testicular volume has a mean value of 1.26 ml ± 1.01 and range of 0.26-6.67 ml, with median and mode values of 0.74 ml and 0.70 ml. The mean length, A-P diameter, and width are 1.70 ± 0.68 cm, 0.80 ± 0.19 cm, and 1.01 ± 0.40 cm in the right, and 1.67 ± 0.65 cm, 1.03 ± 0.43 cm, and 1.00 ± 0.44 cm in the left, respectively [Table 3]. ANOVA analysis of the mean testicular volume per age group compared with values from three previous similar studies by Osemlak,  Goede et al.,  and Sotos and Tokar  with their original values obtained by the ultrasound formula L × W × H × 0.52 converted to the recommended and more accurate Lamberts' formula "L × W × H × 0.71" which was used in this study, multiplying by the factor 1.37 for appropriate comparison were conducted [Table 4]. 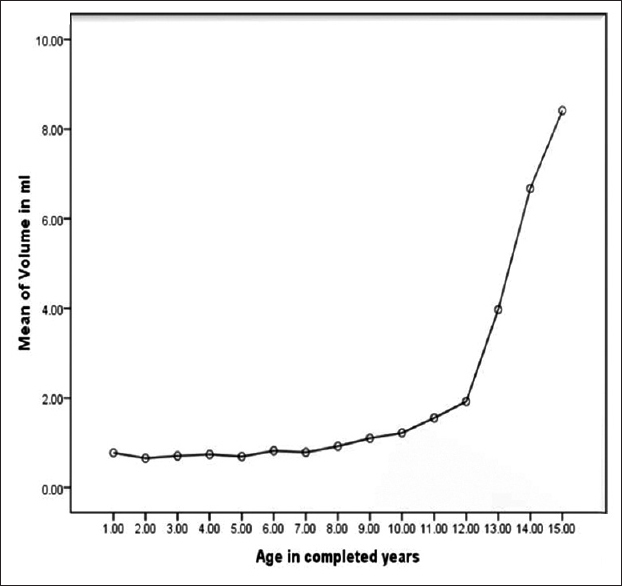 No significant differences were noted in the testicular volume of the various age groups in the first decade of life with a mean volume of 0.74 ml. Thereafter, a progressive steady and significant growth was observed up to the maximal age of 15 years when the testicular volume approaches 8.99 ml [Figure 2], taking a sigmoid pattern of configuration in the plot of age group versus mean testicular volume. During this period of infancy, the mean testicular volume obtained in this study is higher than that of Kuijper et al. This difference is statistically significant (P = 0.000). A plausible explanation for the higher mean value of testicular volume is probably genetic. The testicular volume of subjects aged <11 years in this study is higher than those of the corresponding age group in the study by Sotos and Tokar  though this is not statistically significant (P = 0.131); however, after the first decade, the difference becomes statistically significantly higher (P = 0.006) in favor of the latter. Studies by Goede et al. and Osemlak  showed a similar interesting trend as no significant statistical differences in mean testicular volume were observed between these studies and the index study, between the ages of 0-11 years (P = 0.162 and 0.111, respectively); from age 12 to 15 years, there was marked significant differences observed between this study mean testicular volume, and those of these two previous studies mentioned earlier (P = 0.010 and 0.005, respectively) in favor of the latter. The trend above, probably, reveals that the genetically influenced differences in the testicular volume in both Nigerian boys and their Caucasian counterparts are minimal, that is, why no significant difference is noted in the prepubertal period (during the first decade). However, during puberty, due to the favorable environmental conditions (e.g. cooler weather) and better nutritional status, the Caucasian boys tend to have larger testicular volume than the Nigerian boys of same age bracket. Buttressing this point is the findings of the study on pubertal timing in rural and urban Black South African children using tanner staging by Cameron et al.,  which revealed that urban South African children from higher socioeconomic backgrounds were advanced (i.e., have larger testicular volume) in relation to their rural impoverished peers, and at par with their European counterparts. Main et al. also interpreted the difference that they found between the Finish and Danish testicular volume as possibly environmental instead of genetic predisposition. In this study, although the mean right testicular volume is larger numerically, no significant statistical difference exists between the mean right testicular volume and the mean left testicular volume. This slight decrease in testicular volume on the left side could be due to the fact that the pampiniform plexus of veins are more prominent on the left owing to the most sluggish drainage of the left testicular vein into the left renal vein. This may lead to increased temperature on the left and hence decreased Sertoli cell proliferation. This study shows that ultrasound is able to detect such a small biologically relevant change in testicular volume, hence indicating its value and accuracy in the measurement of the small prepubertal testes. Béres et al. in their studies were unable to establish any correlation between testicular volume and age as against the finding in this study. The reason probably for this might not be far from the fact that a lot of adult values were added, i.e., their subjects' ages ranged between 0 and 28 years, and having established that the testicular volume is maximal at 18 years; , hence, the testicular volume between 18 and 28 years is uniformly constant. This study revealed the start of marked increase in testicular volume to be at 11 years (P < 0.001); this is said to mark the onset of puberty. Ghaly et al. in their study involving 1563 Egyptian boys and also that of Tomova et al. involving 6200 Bulgarian boys, using orchidometer (orchidometer has been shown to correlate well with ultrasound), , both also reported similar age of onset of marked testicular volume increase of 10.56 and 11 years, respectively. Béres et al. established that the maximum testicular volume of 22 ml was reached at 18 years from the data they acquired via orchidometer, but this study could not ascertain the age of maximum testicular volume as the testicular volume still appears to be on the rise at the peak study age of 15 years. Some limitations of this study need to be addressed in subsequent research; candidates with retractile testes were difficult to isolate as the testicular location is variable and might be scrotal at the time of examination. The testicular volume of a retractile testis may be lower; this may have influenced the values of the normal population of boys. Although clinical history and anthropometric data were taken to rule out growth disorder and subsequently exempt such candidates from the study, no other clinical or laboratory investigations were carried out to know if any of the boys were suffering from any covert condition that could influence the testicular volume. This study provides normative values for testicular volume measured by ultrasound in boys aged 0-15 years and these values can also be used as reference values in assessing for different testicular abnormalities. Testicular volume shows significant correlation with weight, age, and height; however, only weight, height, and BMI are statistically significant in predicting testicular volume. The upper limit for the age should be taken up to 20 years to involve the adolescent and hence, deduce the age at which puberty ends and to have an idea about the adult testicular volume. We are grateful to the study participants for granting us their consents. We also appreciate the management and staff of the Ahmadu Bello University Teaching Hospital for their unparalleled support and cooperation. "Testis" Microsoft Encarta® 2009. DVD. Redmond WA: Microsoft corperation; 2008. Butler P. Adam Mitchell and Harold Ellis: The male genital tract. In: Applied Radiological Anatomy for Medical Students. Cambridge: Cambridge University Press; 2007. p. 55-6. Sotos JF, Tokar NJ. Testicular Volume revisited. Int J Paediatr Endocr 2012:17. Doi: 10.1186/1687-9856-2012-17. Available from: http://www.ijpeonline.com/content/2012/1/17. [Last accessed on 2013 Jan 21]. Béres J, Papp G, Pazonyi I, Czeizel E. Testicular volume variations from 0 to 28 years of age. Int Urol Nephrol 1989;21:159-67. Bree RL, Hoang DT. Scrotal ultrasound. Radiol Clin North Am 1996;34:1183-205. Shiraishi K, Takihara H, Kamiryo Y, Naito K. Usefulness and limitation of punched-out orchidometer in testicular volume measurement. Asian J Androl 2005;7:77-80. Taskinen S, Taavitsainen M, Wikström S. Measurement of testicular volume: Comparison of 3 different methods. J Urol 1996;155:930-3. Ankarberg-Lindgren C, Norjavaara E. Changes of diurnal rhythm and levels of total and free testosterone secretion from pre to late puberty in boys: Testis size of 3 ml is a transition stage to puberty. Eur J Endocrinol 2004;151:747-57. Main KM, Toppari J, Suomi AM, Kaleva M, Chellakooty M, Schmidt IM, et al. Larger testes and higher inhibin B levels in Finnish than in Danish newborn boys. J Clin Endocrinol Metab 2006;91:2732-7. Ku JH, Kim ME, Jeon YS, Lee NK, Park YH. Factors influencing testicular volume in young men: Results of a community-based survey. BJU Int 2002;90:446-50. Ghaly I, Hussein FH, Abdelghaffar S, Anwar G, Seirvogel RM. Optimal age of sexual maturation in Egyptian children. East Mediterr Health J 2008;14:1391-9. Osifo DO, Osaigbovo EO. The prevalence, postnatal descent, and complications of undescended testes among children who underwent neonatal circumcision in Benin City, Nigeria. J Pediatr Surg 2009;44:791-6. Kiridi EK, Nwankwo NC, Akinola RA, Agi CA, Ahmed A. Ultrasound measurement of testicular volume in healthy Nigerian adults. J Asian Sci Res 2011;2:45-52. National Population Commission. 2006 National Demographic Survey; 2006. Available from: http://www.population.gov/downloads.html. [Last accessed on 2012 Feb 21]. Osemlak P. Size of testes and epididymes in boys up to 17 years of life assessed by ultrasound method and method of external linear measurements. Med Wieku Rozwoj 2011;15:39-55. Goede J, Hack WW, Sijstermans K, van der Voort-Doedens LM, Van der Ploeg T, Meij-de Vries A, et al. Normative values for testicular volume measured by ultrasonography in a normal population from infancy to adolescence. Horm Res Paediatr 2011;76:56-64. Chin T, Liu C, Wei C. Testicular volume in Taiwanese boys. Zhonghua Yi Xue Za Zhi (Taipei) 1998;61:29-33. Kuijper EA, van Kooten J, Verbeke JI, van Rooijen M, Lambalk CB. Ultrasonographically measured testicular volumes in 0- to 6-year-old boys. Hum Reprod 2008;23:792-6. Cameron N, Crieve CA, Kruger A. Secondary sexual development in rural and urban South African Black children. Ann Hum Biol 1993;8:583-93. Ellis H. Male Genital Organ. Clinical Anatomy. 11 th ed. Oxford: Blackwell Publishing Limited; 2006. p. 365-6.